Pakistan's only self-declared Jew is fighting an uphill battle to maintain Jewish cemetery from encroaching Muslim graveyard. While Benkhald has sent letters and launched a Twitter campaign, his requests have gone ignored by the authorities, and the cemetery continues to remain untended for. Currently Chand Arif, the self-styled caretaker of the graveyard who has been squatting there with his extended family and several goats for two generations, remains in de facto control of the Jewish cemetery. "There are people who want to come over and make this a Muslim graveyard," Arif said. "They tell us we will give you money to give this area to us." 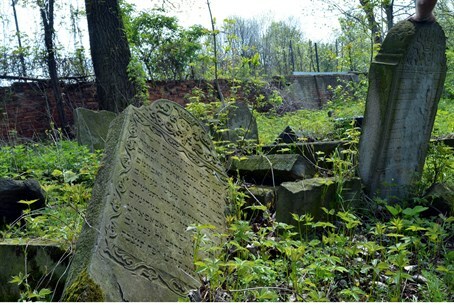 The Jewish cemetery is being encompassed by the Mewa Shah burial district which is fueling the requests to take over the Jewish cemetery and turn it into a Muslim cemetery. Karachi architect Arif Hasan, who is a member of the provincial government's cultural heritage committee, told the British paper he has proposed to turn the Jewish graveyard into a protected site. "Naturally there is an anti-Israel feeling which is very strong," said Hasan. "But this is our heritage, irrespective of whether we are Jewish, Muslim or Christian, and we have to protect it." Most of the 300 graves that remain in the cemetery date from the mid-19th century CE. In one corner a grand sarcophagus housed in a square sandstone building holds the remains of Solomon David, founder of the Magen Shalom synagogue in Karachi who died in 1902. The synagogue was replaced with an apartment building in the 1980s, with the request of one of the last remaining Jews in the city to provide a replacement synagogue ignored by the developers. Nearly all of Pakistan's Jewish community was forced to flee the Muslim nation amid rising attacks following the foundation of the modern State of Israel. Aside from Benkhald, a small handful of Jews are thought to still remain in Karachi, although they apparently have all intermarried or hidden their identities.